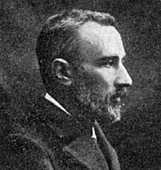 Pierre Curie (1859-1906) was born in Paris and privately tutored until entering university. At age 21, Pierre and his brother Jacques (age 24) found, after considering the arrangement of ions in crystals, that such crystals produce an electrical potential (Voltage) when compressed. This is now called the piezoelectric effect. Conversely, the same crystals shrink when placed in an electric field. These reciprocal properties helped them develop the role of symmetry in the laws of physics. They immediately devised a sensitive piezoelectric electrometer. Similar devices are now used in microphones, quartz watches, and various other electronic components. Pierre undertook an investigation of the changes in metal magnetism at varying temperatures. Today the temperature that a heated ferromagnetic material losses magnetism is called its Curie temperature. Marie (1867-1934) was born and raised in Warsaw which was under the control of the Russian Czar who hoped to stamp out the Polish language and culture. Marie´s family were both teachers who believed the hope of Poland lay in preserving and advancing their culture though education. Because advanced education of women was precluded in Warsaw, Marie and sister Bronya worked in turn to provide the college education of the other in Paris. While she worked, Marie illegally studied chemistry with a former assistant of Dmitri Mendeleev. Once in Paris, she survived winter by eating little and wearing every piece of her clothing. She overcame a deficient background by hard work, earned degrees, and won a scholarship to study magnetic properties of steels. Uranium's rays are constant regardless of the physical state or chemical combination of the Uranium. The radiation depended only on the amount of Uranium and was therefore a structural property of the Uranium atoms. A survey of other elements found Thorium compounds emitted similar radiation. They invented the term radioactivity in 1889 to describe the property. Joined by Pierre, Marie found that pitchblende and chalcolite were more radioactive than pure Uranium. Apparently pitchblende contained additional radioactive elements. They used Pierre´s electrometer to trace minute amounts of radiation through repeated chemical separations. In July 1898 they found a Bismuth fraction contained a radioactive substance which they named Polonium (Po). In December 1898 they found a Barium fraction contained another radioactive substance which they named Radium (Ra). Moving to a storage shed open to the weather, they spent three years isolating 0.1 g of Radium from a ton of donated scrap ore.
Pierre and a student noticed a speck of Radium emits heat. This was the first discover of nuclear energy. 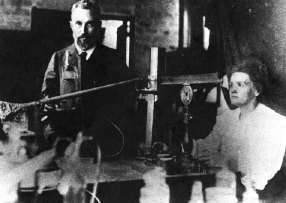 For their work investigating radioactivity, the Curies shared the 1903 Nobel Prize for Physics with Becquerel. The prize brought fame, requests for talks, an offer for a book, and most importantly, funds to advance their research. 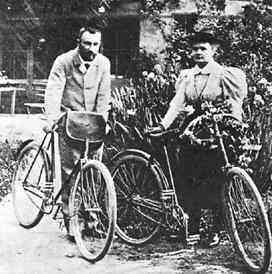 But both Curies had to postpone accepting the prize because of deteriorating health including permanent finger tip damage from radiation exposure. In 1906 with recovering health and a new university appointment at the Sorbonne, Pierre was instantly killed by a horse drawn munitions wagon while crossing the street in a rainstorm in front of his publishers office. Marie succeeded him as professor at the Sorbonne and became its first woman professor. In 1907 with a grant from an American, she formed the Radiation Institute. With additional government, industrial, and individual grants, the Institute became the world center for study of radiation. For her continued work on the properties of Polonium and Radium and the nature of radioactive decay she was awarded the 1911 Nobel Prize for Chemistry and became the world´s only double Nobel laureate. The Curies had two daughters. Irène was born in September 1897. The family lived with Pierre´s recently widowed father, a physician whose baby sitting allowed both parents to work. Irène Curie married Joliot Frédéric. They became the stars of the Radiation Institute. Irène and Frédéric won the 1935 Nobel Prize for Chemistry for artificially creating new radioactive elements. For example they made an isotope of Nitrogen by bombarding Boron with alpha particles. 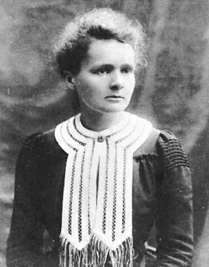 Eve Curie became a famous author and lecturer. In 1925 Marie helped establish safe procedures for working with radiation. In 1934 at an age of 67, Marie died of incurable blood anemia, probably leukemia caused by long term radiation of her bone marrow.